An MP is demanding an investigation after a stroke victim claimed she was told she must undergo a back-to-work test – while in a hospital stroke unit. Labour’s Iain Wright said the case was one of the most disgraceful he had heard from constituents on sickness benefits who have been told to undergo a work capability assessment (WCA). Mr Wright said the woman, who did not wish to be identified, had come to him in great distress, blaming the actions of the private firm Maximus, which carries out the assessments. He told The Independent: “I found this case both utterly shocking and completely disgusting. Mr Wright vowed to write to Work and Pensions Secretary Damian Green to demand to know whether such practice was allowed – and to get a “full apology to my constituent”. The case is the latest in a very long line of controversies surrounding the WCA, which is undergone by sick and disabled people attempting to claim Employment and Support Allowance (ESA). Just back from accompanying someone to an ESA a work capability assessment, run by Maximus. Got in, sat down, got out my clipboard to take notes and the ‘Health Care Professional’ told me I wasn’t allowed to take notes. When I said this was not the case she had the nerve to ask me to tell her where it was written that I could take notes. I have accompanied people to a good few assessments and have always taken notes, and I didn’t back down, and she dropped it. I took notes. Last time I went to an assessment the ‘Health Care Professional’ told me there was no point in taking notes as they would not be accepted at a tribunal. I knew this to be a flat out lie, but didn’t make an issue of it, just kept on taking my notes. Is this a new official Maximus tactic to disadvantage claimants, or just coincidence? A TENANTS’ champion who has been told he must go back to work despite having four heart attacks says he has been left “financially destitute” and shivering cold with only a duvet to keep him warm. The 61-year-old man – a longstanding District Management Committee activist who did not want to be named – has been fighting for his Employment Support Assessment (ESA) benefits to be reinstated after they were removed following a “work capability assessment” on September 9. The man has been diagnosed with pancreatitis, heart disease and suffers from “anxiety and stress”, according to his appeal letter, which adds that his condition has “deteriorated considerably” since the test. On Tuesday, the Department for Work and Pensions (DWP) dismissed his appeal saying they did not have to take this into consideration and are satisfied that his condition is not “uncontrollable or life-threatening”. 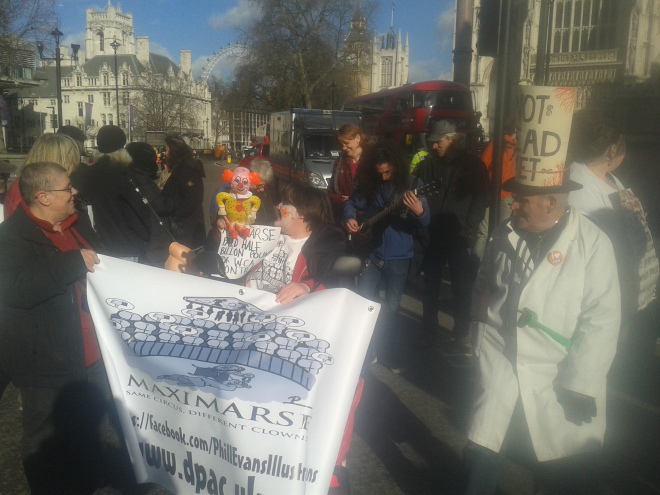 The Camden tenant has for several years received £315 a fortnight of ESA – benefits for people who are too ill or disabled to work – but it was immediately halted after his assessment. 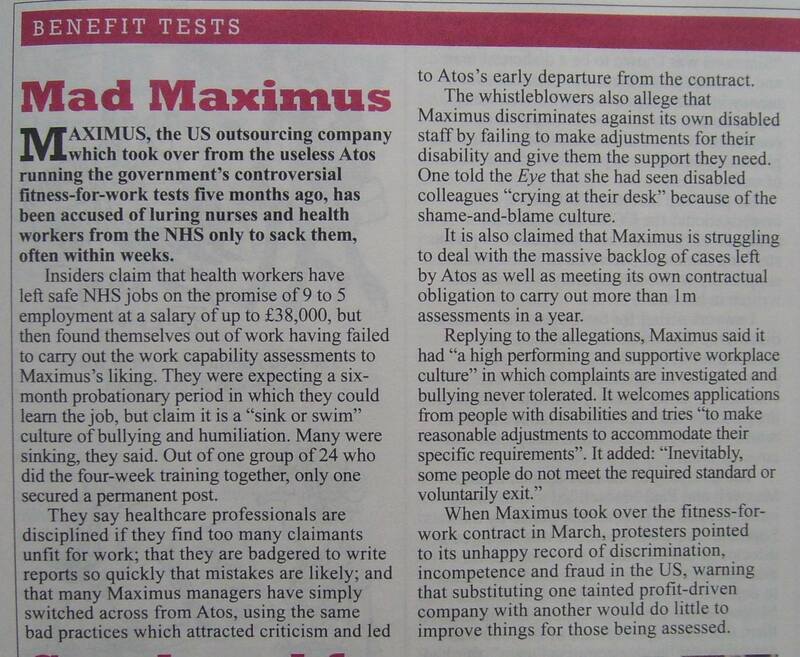 The assessments used to be carried out by Atos, but the company and the government has cut ties and they are now run by an American company called Maximus. He has spent time being fed through a tube in hospital this year for his pancreatitis but has been told to fill out 50-page forms to retain his benefits. People with mental health conditions are being denied the opportunity to complete an application form for sickness benefits. An investigation by Benefits & Work found that Maximus – who is one of the private contractors replacing Atos – are not sending application forms (ESA50) for Employment and Support Allowance (ESA) to some claimants with mental health conditions. Benefits & Work say that the forms are vital for understanding how a claimant’s health effects their ability to work, prior to being asked to attend a face-to-face assessment – otherwise known as the Work Capability Assessment or WCA.